Samir Khan sat on the floor of a Charlotte, North Carolina mosque, describing his pro-al-Qaeda blog to a reporter from The New York Times. Khan was 21-years-old, living in his parents’ basement, where he continued to nurse an affinity for Islamic extremism despite their repeated interventions. On his website, he published translations of radical religious treatises, links to violent insurgent videos, and his own extremist commentary—all for a modest following. It was early in his radicalization. Khan drew a line between himself and the terrorists: “I’ve never told anybody to build bombs,” he told the Times reporter. Within a few years, Khan had created Jihad Recollections, a 70-page magazine that featured screeds from fundamentalist figures and a guide to night-vision technology. By 2009, he was boarding a flight to join al-Qaeda in the Arabian Peninsula (AQAP), an affiliate of al-Qaeda’s central command, still headed at the time by Osama bin Laden. There, in Yemen, under the supervision of Anwar al-Awlaki, a charismatic cleric and fellow US citizen who ran AQAP’s official propaganda wing, Khan would re-launch his publication with a soon-to-be infamous name: Inspire. 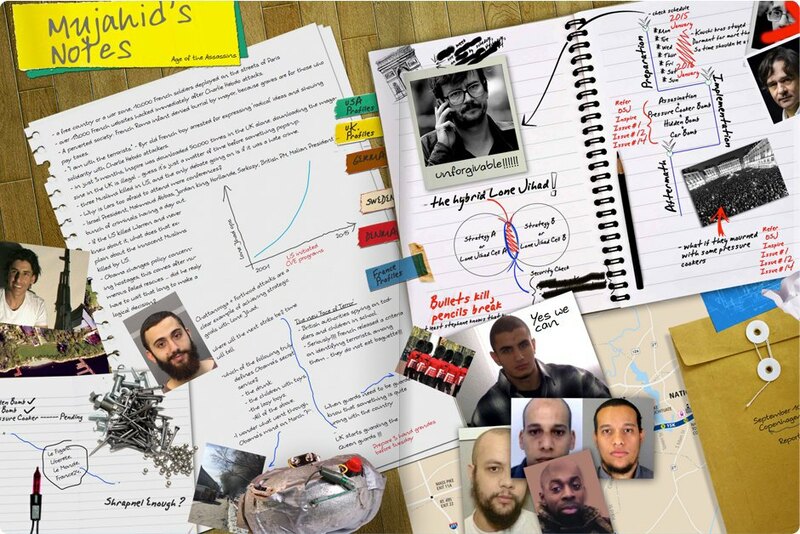 Despite Khan’s earlier claims, the first issue of Inspire amounted to an in-depth plea for young jihadis to launch terror attacks across America; a tutorial titled “Make a Bomb in the Kitchen of Your Mom” was one of the cover stories. English-language newsletters for mujahideen have existed since at least the 1980s, often including the same kind of material—religious exhortations, political tirades, and aspirational photographs of clerics and combatants. 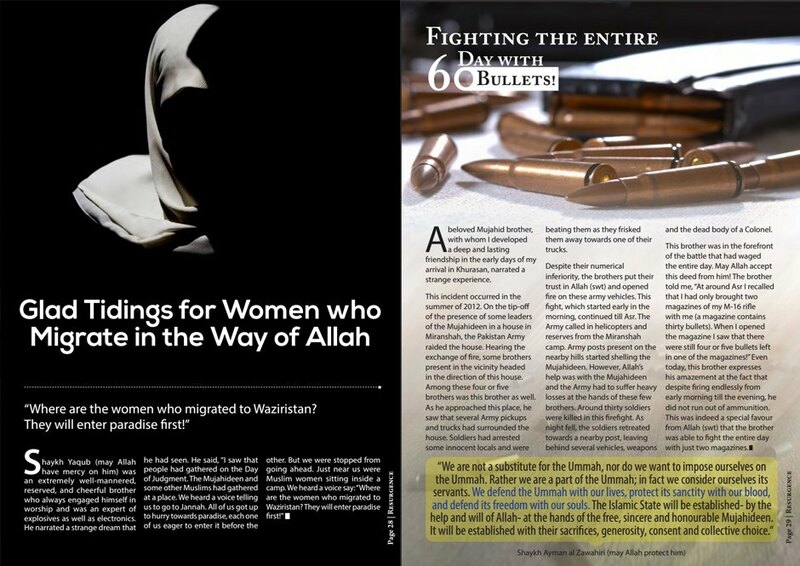 Al-Qaeda, for its part, wasn’t new to publishing—its long backlist even includes several magazines targeted at women, though these were published in Arabic, not English. Around the same time Khan was producing Inspire, a digital lifestyle publication called Al-Shamikha (“Majestic”) made headlines by garnering comparisons to a jihadi Cosmopolitan. It presented beauty tips—try a honey mask, don’t towel too forcefully, protect your skin from the sun by wearing a fuller veil and staying at home—alongside admonishments to support the martyrdom of husbands and sons. In the grand tradition of ladymags, one article even offered advice on how to marry a mujahid. But Inspire’s chief innovation was to include a feature called “Open Source Jihad” with the usual propagandist fare. The how-to series instructs readers on the practicalities of terrorism, ranging in degree from the horrifying to the near-comical. (One issue describes how to build a bomb that can be smuggled onto a commercial airliner, while another proposes greasing a windy roadway with “40 liters” of “lubricative oil” to increase the likelihood of cars overturning.) Similar to other outlets of its ilk, it is circulated as a PDF file, that is, laid out like a traditional print magazine, but disseminated primarily through digital channels. Of course, being angry at American imperialism and Islamophobia is not a form of terrorism; these are real and important issues. But the letter demonstrates neatly how propaganda initiatives like Inspire attempt to harness legitimate critiques for their own destructive ends, framing terror as a form of political protest to an imagined audience of disaffected teens. “You are Lethal! You are Devastating! You are the knight who strikes the enemy’s heart, penetrating his armor, exposing his vulnerabilities… you and you alone—the terrorist next door,” Inspire trumpets to would-be followers. The first issue offers boilerplate advice to those thinking about traveling to the Middle East in support of the cause (“bring a friend,” “don’t stick out like a sore thumb”). But, generally speaking, AQAP’s priority is enlisting them to carry out strikes in the West instead. Despite hiccups in the initial release (including an intervention by British intelligence agents involving cupcakes), Inspire has published 14 issues so far. Khan produced six of them before he was killed in a controversial US drone strike alongside his mentor al-Awlaki, though the magazine has continued to appear since his death. 2004: Abu Musab al-Zarqawi establishes al-Qaeda in Iraq (AQI). JUNE 2006: al-Zarqawi is killed in a US strike. Abu Ayyub al-Masri takes his place as leader of AQI. OCTOBER 2006: al-Masri announces the creation of Islamic State of Iraq (ISI), and establishes Abu Omar al-Baghdadi as leader. APRIL 2010: Abu Bakr al-Baghdadi becomes leader of ISI after al-Baghdadi and al-Masri are killed in a joint US-Iraqi operation. APRIL 2013: ISI declares its absorption of an al Qaeda-backed militant group in Syria, Jabhat al-Nusra, also known as the Nusra Front. Al-Baghdadi says that his group will now be known as Islamic State in Iraq and the Levant (ISIS). Nusra Front rejects the attempted merger. FEBRUARY 2014: al-Qaeda renounces ties to ISIS after months of infighting between al-Nusra Front and ISIS. JUNE 10-11, 2014: ISIS takes control of Mosul and Tikrit. JUNE 29-30, 2014: ISIS announces the creation of a caliphate (Islamic state) that erases all state borders and changes its name to Islamic State (IS). The UN reports that an estimated 1.2 million Iraqis have been forced from their homes. The Pentagon says the US is sending an additional 300 troops to Iraq, bringing the total to nearly 800. AUGUST 6, 2014: ISIS attacks the northern Iraqi town of Sinjar, home of a religious minority group, the Yazidis. A Yazidi lawmaker says that men are being killed and women, sold into slavery. AUGUST 19, 2014: In a video posted on YouTube, American journalist James Foley is beheaded by ISIS militants, triggering a spate of publicized killings of Western captives that would come to define ISIS's propaganda machine. By September, American journalist Steven Soltoff and British aid workers David Haines and Alan Henning join the list of victims. A decade later, the AQI goes by another name: The Islamic State of Iraq and Syria, or ISIS. The letter proved to be early evidence of the coming split between the two groups over ISIS’s murder of fellow Muslims who disagreed with their strategies and ideologies. With photo shoots of mass executions and videos of beheadings, the group hasn’t backed off the shock tactics. And it’s now pouring big money into propaganda—about $155,000 per month in just one of its roughly 30 “provinces,” according to documents obtained by Middle East Project fellow Aymenn Jawad al-Tamimi, who spoke to Hopes&Fears. Some of that endowment has been funneled into the production of its own magazine, Dabiq—named after a small Syrian farming town that plays an important role in Islamic prophecy and fell to ISIS in the summer of 2014. “Inspire serves more as a how-to guide for individual attacks than an articulation of an overall religious, military, and political vision,” wrote Harleen Gambhir, an analyst at the Washington D.C.-based Institute for the Study of War. With Dabiq, on the other hand, ISIS seized on the potential of a long-form media outlet—attempting to express the caliphate’s story as a fully fleshed narrative. Its content offers insight into ISIS’s philosophy that could not be communicated by a viral video, no matter the production quality. Still, Twitter is excellent for spreading the content. Once an issue is finished, Weyers explains, its creators upload the PDF to the deep web—the part of the internet that can’t be indexed by search engines. Then, they post the link to various social media platforms. Once it goes live, it can be downloaded, re-uploaded, archived and shared by “fanboys,” as al-Tamimi calls them. The usual suspects are 17- to 26-year-old men, Weyers says. And they’re already on board with radical Islam, according to al-Tamimi. Rather than converting anyone, magazines like Dabiq and Inspire become part of supporters’ media diet, reinforcing their existing attitudes, al-Tamimi explains. Just like partisans watching cable news, those who invest the time immersing themselves in the long, often tedious reports emerge fired up by the affirmation of their beliefs. Dabiq is calculated to turn that energy towards a specific goal: hijra, or emigration. “Many readers are probably asking about their obligations towards the Khilafah right now,” the “Dabiq team” wrote in a foreword to issue two last summer. “The first priority is to perform hijrah from wherever you are to the Islamic State.” The message suits ISIS’s strategic goals. In order to be a functioning state, they require a populace to submit to their government: soldiers to fight in their wars, doctors to treat their sick and wounded, and judicial scholars to justify their hard-line interpretation of Shariah law. Yet ISIS’s military-style conquests and iron-fisted rule have caused Syrians and Iraqis (especially religious minorities) to flee in massive numbers, exacerbating the flow of refugees out of the region. “There are homes here for you and your families,” a foreword assures potential new members—homes left vacant by those who have fled or been killed Dabiq, then, directs its message to an audience much larger than Inspire’s, in order to repopulate the land vacated by the mass exodus. To that end, each issue mingles battlefield updates with generous portrayals of domestic life in ISIS-controlled territories. Readers are told that hijra is not just an option, but an obligation now that a caliphate has been established. Those who emigrate will be forgiven; while those who choose otherwise will be considered hypocrites come the End of Days. The pitch: “You can be a major contributor towards the liberation of [Mecca, Medina, and Jerusalem]. Would you not like to reach Judgment Day with these grand deeds in your scales?” For those on the fence, the magazine reminds them that they will die either way. 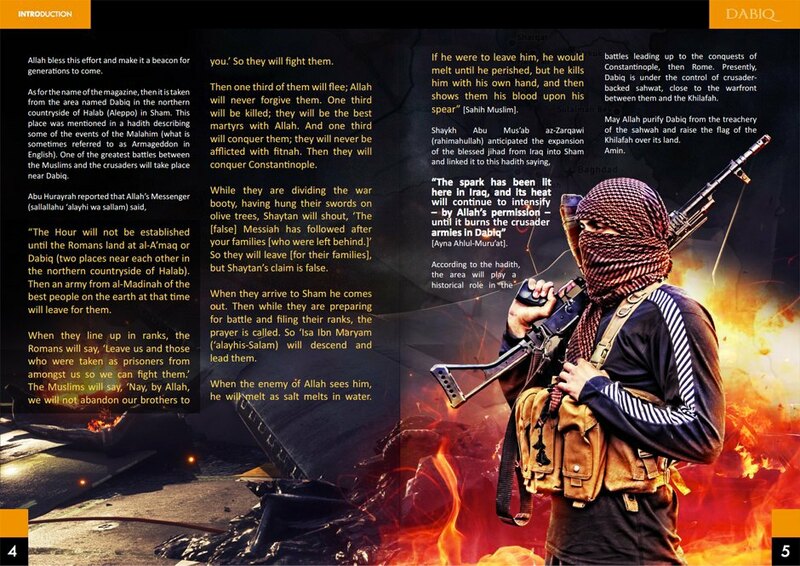 The doomsday narrative is great motivation for ISIS supporters: the group claims to be the caliphate that will lead the Muslim world to the apocalypse. Even the name Dabiq reinforces this association, referencing a prophecy that the caliphate will defeat the forces of “Rome” (according to Gambhir, this means the West) in the rural community northeast of Aleppo. From there, according to legend, the caliphate will press forward to conquer present-day Istanbul before the “redeemer” of Islam appears on earth (ISIS titled its Turkish-language magazine Konstantiniyye, after its historic name, Constantinople). September 23, 2014: The US carries out airstrikes against ISIS. November 14, 2014: The UN Independent International Commission of Inquiry on Syria concludes that ISIS has committed war crimes and crimes against humanity. February 11, 2015: President Barack Obama asks Congress to formally authorize use of military force against ISIS. February 26, 2015: Jihadi John, the disguised man with a British accent who appears in ISIS videos as the executioner of Western hostages, is identified as Mohammed Emwazi, a Kuwaiti-born Londoner. March 4, 2015: ISIS releases images of a man being thrown off a building in Raqqa, Syria. This is one in at least half a dozen cases in which ISIS has killed a man for allegedly being homosexual. March 7-12, 2015: In an audio message purportedly from Boko Haram leader Abubakar Shekau, the Nigeria-based radical Islamic group pledges allegiance to ISIS. An ISIS spokesman claims the caliphate has expanded to western Africa and accepts the pledge. June 19, 2015: The State Department issues its annual terrorism report, declaring that ISIS is becoming a greater threat than al-Qaeda. June 26, 2015: A gunman kills at least 38 people at a beachfront Tunisian hotel. ISIS claims responsibility for the attack. July 17, 2015: ISIS detonates an ice truck in a crowded Iraqi marketplace during Eid al-Fitr, killing at least 120 civilians and wounding at least 160 more. July 2015: According to IHS Jane's, the territory controlled by ISIS saw a 9.4% reduction in the first six months of 2015, putting it at roughly 32,000 square miles. August 2015: ISIS destroys antiquities in the historic city of Palmyra in the Syria, including the nearly 2,000-year-old Temple of Baalshami. UNESCO calls the destruction a "war crime." After ISIS declared itself a caliphate last year, some analysts argued that it threatened al-Qaeda’s role as the flagship organization for Islamic extremism, with military gains and effective messaging rendering the older group “impotent and irrelevant,” at least in the eyes of potential new recruits. 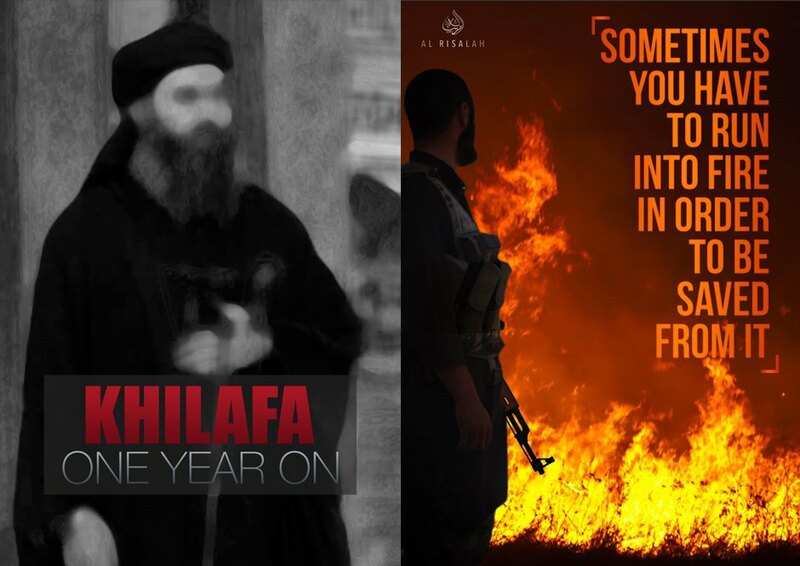 Since then, al-Qaeda affiliates have launched at least two more English-language magazines, perhaps sensing the danger of allowing ISIS to define the meaning of global jihad for interested Westerners. Resurgence, attached to a new affiliate called al-Qaeda in the Indian Subcontinent (AQIS), came out with the tagline “Unshackle your minds!” “Resurgence is al-Qaeda trying to make themselves more relevant,” Weyers says. Yet it resurrected familiar narratives about Muslims everywhere being under attack, pointing to religious oppression in countries like Burma and India and calling on its followers to liberate Palestine. Not until its second issue, which consisted solely of a posthumous 85-page interview with al-Qaeda spokesman Adam Gadahn, did the magazine address ISIS head on. “This self-appointed ‘caliphate’ is not the Caliphate for which generations of Mujahideen and martyrs have been working,” Gadahn argued. Elsewhere, in Syria, rebels associated with Jahbat al-Nusra, or the Nusra Front, have launched their own magazine, Al-Risalah. (Nusra Front is the Syrian al-Qaeda affiliate, fighting to depose president Bashar al-Assad; resist ISIS; and likely, in the long term, secure a safe haven for the organization in the region.) In theory, Al-Risalah is unconnected to al-Qaeda; it calls itself the official magazine of the mujahideen in Syria, with much of its writing focused on those who have died as “martyrs” in the fight against the Assad regime. It’s put together by supporters of the group but not at the group’s command, according to a self-identified Nusra Front member using the nom-de-guerre Abu Saeed al-Halabi, who spoke to Hopes&Fears on Twitter. Al-Qaeda’s attempts to rebrand itself as sensible alternative to ISIS has been successful to an extent: America’s regional allies have aided Syrian rebel groups that fight alongside the al-Qaeda affiliate. If the right foreign actors get the impression that al-Nusra Front is less bloodthirsty and more moderate than ISIS, al-Tamimi suggests it could lead to greater support from Saudi Arabia, or other strategic benefits. It’s not just al-Qaeda affiliates penning responses to Dabiq—and it’s not just jihadis, either. Alarmed by the tide of British nationals joining ISIS’s ranks, and the group’s vast social media output, a group of Muslim leaders in the United Kingdom released their own magazine, Haqiqah, last March. The name means “truth” or “reality,” and from its title font to its color palette, Haqiqah mimics the Dabiq aesthetic. Yet it replaces the Islamic State’s noxious rhetoric with rebuttals to its arguments. Scholars weigh in, verse by verse, with explanations of the scripture used by extremists to underwrite violence. Jihad, the magazine explains, is not the murder of others or the destruction of oneself, but the inner struggle for self-improvement. Madison Pauly is an editorial fellow at Mother Jones. She tweets @msjpauly.